We’re starting up our prospect profiles again! Hurray! Seriously, draft season is my favorite time of year. I absolutely love scouting and dissecting players. There are so many awesome websites out there that help to break down these players. We’ll do one a day until the draft. These prospects are a mix of guys who the Giants will target and guys the Giants should target. For example, we’re not going to profile Andrew Luck, because he’s not going to be a Giant. We’re not going to profile Trent Richardson, or Matt Kalil. We will profile guys who fit a need and will be there when the Giants pick. We’ll do all round prospects, focusing on guys who fit our image of what the Giants should pick. We’ll link to scouting reports (and be sure to check all those sites out) and provide our own analysis. Let’s do it! A solidly built athlete, but is a little narrow through the waist and doesn’t have a ton of girth through his lower half. Doesn’t look real muscular through the upper half as well. Regardless, the guy is just a football player. Is one of the best pure tacklers in the country and does a great job breaking down inside, lowering his pad level into contact and wrapping consistently. Showcases “plus” instincts inside vs. the run game. Keys quickly, is consistently getting early jumps on the football and showcases a little burst when attacking downhill. Does a great job extending his arms into contact when asked to avoid blocks and knows how to fend off blockers trying to get into his frame. Uses his inside hand well to keep blockers at bay once he side steps contact. Isn’t overly shifty, but consistently is able to beat a blocker to a spot because of instincts, gain leverage and keep himself clean. Showcases the power to take on blocks in the hole as well. But, isn’t overly long and opposing lineman will simply wrap him up and engulf on contact. Showcases a willingness to try to shed, however, is only average in this area. Takes excellent angles in pursuit. Showcases the ability to instantly key on the run and reaches top end speed quickly. Doesn’t have a great first step and straight-line speed is only average. However, plays faster because he routinely gets early jumps on the football, understands angles and has a little burst when he’s finishing on the ball carrier. Wraps well in space, brings his legs through contact and knows how to get his man to the ground. Isn’t the most powerful kid on contact and isn’t going to force a ton of fumbles on contact. Is an above-average open field tackler as well. Lacks a little range, but shoots well into contact, takes good angles and routinely gets bigger/faster ball carriers to the ground, even if they gain a step. Possesses a good feel in zone coverage. Keys wells, feels routes developing around him and stays low and balanced in his drop, allowing him to quickly change directions. Demonstrates the ability to re-direct and get out of his breaks laterally. However, doesn’t generate much of a burst or first step. Is clean to change directions, but there is no initial burst that allows him to routinely make plays on the throw, as he forced to often just play the man. Gets average depth when asked to turn and run down the field with tight ends. But, lacks great straight-line speed (looks like a 4.8 guy) and the further down the field he’s asked to run the more separation he gives up. Nevertheless, displays good ball skills and is smart enough to key quickly in the pass game and mature into an average option in zone as an ILB. Impression: He’s not the biggest, strongest or fastest of athletes. But he’s instinctive, plays faster than he times, finds the football in all areas of the game and can really tackle. He’s going to be a bit limited in coverage, but he’s instinctive enough to play on third down in zone and should end up being one of the NFL’s top tackling linebackers for years to come. Coverage: When dropped in zone coverage, Kuechly has high football intelligence to read plays as they develop around him. May not have the best athleticism to redirect quickly, but has the smarts to compensate for it. May not have the vertical speed to turn and run with some tight ends. Instincts/recognition: Elite level instincts. Seems to always be flowing to where the ball is going long before it gets there. Kuechly will rarely blow an assignment. Won’t get tricked by misdirection plays. Doesn’t get picked off by pulling guards. Pass rush: At Boston College, Kuechly was never used as a blitzed and only got pressure when the play took a long time to develop. In the right situation, where there is an open hole to get at the quarterback, Kuechly could become useful in this area. Pursuit: Plays with a lot of discipline, not overrunning the play or getting out of position. Is a technically sound linebacker who always plays with his head up and keeps blockers out of his feet. Quick to diagnose misdirection and screens. Run defense: Sniffs out the ball in a hurry. Kuechly is a sound wrap-up tackler who knows how to lower his shoulder and drive through contact. Struggles some taking on and shedding blockers, especially in the box. Isn’t a great playmaker. A lot of his tackles came up field. Strength: Kuechly doesn’t have an overly strong frame and doesn’t have a powerful build. He could get stronger in his upper body to take on blocks better. Final word: At the college level, Kuechly is arguably the most accomplished player in this year’s draft. An All-American each of his three seasons at Boston College, Kuechly led the nation in tackles as a sophomore and junior. He’s instinctual and will be able to contribute immediately as a rookie. His upside, though, is limited because he’s not the strongest or a natural athlete. Kuechly has been nothing short of incredible ever since the beginning of his career at Boston College. The Cincinnati, Ohio native started 12 games at linebacker even as a freshman in 2009 and in 2010 he earned First-Team All-American honors. He is on his way to doing the same as a junior. Kuechly has a ridiculous 80 solo tackles and 70 assists through nine games for a horrendous Golden Eagle squad. His 150 tackles are a hard-to-believe 85 more than any other player on the team. Kuechly has 8.5 tackles for loss and two interceptions, also best on the team. Kuechly has good size at 6’3” and 237 pounds, although he could add some bulk heading into the next level (and there is no reason why he won’t go pro; he has done everything he can in college and Boston College is terrible). He generally runs in the 4.7s in the 40-yard dash and has been clocked as fast as 4.68 from that distance. He is not an elite athlete and his relative lack of speed has never allowed him to be a prolific pass-rusher or sack-master. Quite simply, though, Kuechly has an incredible nose for the ball and is one of the most fundamentally-sound tacklers in the business. His instincts are second to none and those make him a solid pass defender despite lacking the athleticism that most ACC and NFL linebackers have. 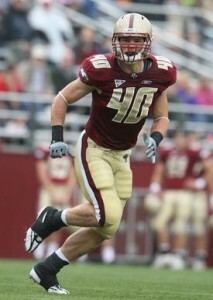 Kuechly should be a first-round pick in the 2012 draft. Keuchly is the stud linebacking prospect. He was incredibly productive; He’s not very fast. He’s not the best athlete. He’s a football player. Cliche? Yes, but it’s true. The guy finds the football and makes plays. He’s not going to be the best in coverage; he’s a downhill linebacker, who excels when the plays are in front of him. His instincts will help him a lot in coverage. Won’t run with tight ends but will stay in his zone and cover it well. Is he going to be an elite LB? Depends on if his athletic limitations come back to haunt him. If he’s smart enough to compensate, he’ll be fine, he’ll be a tackling machine. If not, he’ll be an overpaid special teamer. But, I think he will be at least a solid starter, probably best suited to be a two down guy. He won’t wow you, but he’ll get the job done. Will he be a Giant? Not if the Eagles have anything to say about it. I can only imagine that they are salivating at taking Keuchly to solve their linebacking woes. But if not, if something else happens, he could slide. And if so, I think he should be on the Giants radar. No, he’s not the athletic freak that might be needed, but he’ll be the middle linebacker for the next 10 years, and that is worth something. One problem: the giants do not draft need. He is not the future at MLB for next 10 years. that’s just foolish. 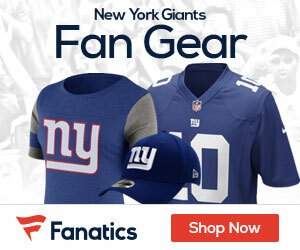 Giants will use 1st round on OT or TE. Way over salary cap and Ballard/Beckum could be out next season. I think as I said he will be gone by the time the Giants pick. I don’t think he’s that great. He’ll make a team and probably start for a while but he will not be expected to be a big play maker, just run the defense and be a solid pro type player. If he is drafted by a team who visualizes him as a bigtime playmaker they will be disappointed. He will need time in the weight room too.